This guide contains tips showing how to install Windows 8 on a virtual machine running on Oracle Virtual Box. This step by step tutorial will help you configure virtual machine on Oracle Virtual Box Manager for the Microsoft Windows 8 beta release installation. For completing the Windows 8 setup successfuly, you should take care of important configuration settings like to enable PAE/NX feature or enable hardware virtualization especially for x64 Windows 8 installation. If you did not download Oracle VirtualBox yet, please first get your Oracle VirtualBox download for your operating system. After you download VirtualBox and complete installation, create virtual machine to install Windows 8 on Oracle Virtual Box. You can continue with steps illustrated at How to Install Windows 8 Consumer Preview Release for completing the Windows 8 setup. Virtual Hard Disk creation for Vindows 8 on new virtual machine. If you are not attaching an existing Windows 8 virtual machine disk for your new Win8 virtual machine, choose "Create new hard disk". The wizard recommends 20 GB as a start-up disk size. Generally it is recommend to use Dynamically allocated virtual disk file to save storage space form your physical hard disks. To create a fixed size virtual disk file may take longer time when compared with creating a dynamically allocated virtual disk file. Choose the file name and the file folder where the new virtual disk file location will be on your hard disk. Also at this step of Oracle VirtualBox configuration, select the maximum size of the new virtual machine disk. Your virtual disk will not be larger then the file size you define here. You can enable hardware virtualization options to "enable VT-x/AMD-V" and to "enable Nested Paging"
You an also configure video memory settings and your monitor count on the Display tab of the Virtual Machine Settings screen. You can now choose the drive which includes the bootable Windows 8 setup DVD for your new virtual machine installation. After all above Oracle VirtualBox configuration settings are configured, you can now start Windows 8 installation on virtual machine. 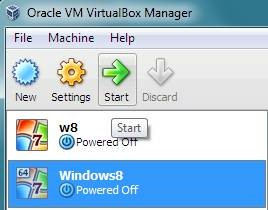 Highlight new virtual machine Windows8 and press Start icon on Oracle VM VirtualBox Manager menu. Then please follow the installation steps demonstrated at How to Install Windows 8 on Virtual Machine for a successful Windows 8 setup.